Terminal Engineering Corp (TEC) were in business during the twenty year period, 1916 to 1936. They were located at 599 11th Ave. only their last two years, 1935-1936. The Directory of Directors in the City of New York, 1918, listed the following as officers at Terminal Engineering: Willard Cope Brinton (1880-1957), Richard Jewell Dearborn, (1881-1972) and Harry F. Thomson (1886-?). Willard C. Brinton seems to have been the primary guiding force at Terminal Engineering. He was born in Pennsylvania, 20 Dec. 1880, and is found in the 1900 U. S. Census, age 19, living with father and mother in West Goshen, Chester County, Penn. Brinton was a Harvard graduate and was listed in the 1913 Harvard University Alumni Directory: occupation, Mechanical Engineering, address, City Club of New York, 55 W. 44th St., New York, NY. His name appeared in the 1914 New York City telephone directory at 7 E. 42nd St., which by 1916 was the address of Terminal Engineering. He was recorded in the 1915 New York State Census, age 35, an engineer, living at 55 W. 44th St. In 1916 he applied for a passport in order to travel to Japan and China with Charles K. Eagle of J. H. & C. K. Eagle Corp., silk manufacturers. In 1918 Brinton registered for the World War I draft when he gave his occupation as "Consulting Engineer, several clients." In the 1920 U. S. Census Brinton, still single at age 39, continued to live at 55 W. 44th St. By 1925, however, Brinton had moved to Croton-on-Hudson, Westchester County, where he lived with his wife, Laura M. In the 1930 U. S. Census Laura M. Brinton's occupation was "Designer, Pottery." Brinton's death notice, New York Times, 30 Nov. 1957, read, "Brinton - Willard Cope, loving husband of Laura M. Brinton, suddenly on Nov. 29; also survived by brother, Clement B. Brinton. Services private, Nov. 30. Memorial services Tuesday, Dec. 3, 3:15 P. M., Scarsdale, Friends Meeting House, 131 Popham Road, Scarsdale, N. Y." Richard J. Dearborn was a patent lawyer and was probably associated with Terminal Engineering for protecting patents on their manufactures. He was born in Manchester, New Hampshire, 17 Dec. 1881, and was practicing law in New York by the 1910s. He registered for the World War I draft in 1918, age 36, when he lived in Summit, New Jersey, and was employed as a patent lawyer at Marshall & Dearborn, 160 Broadway, New York. That same year the Directory of Directors in the City of New York listed him as "Secretary and Director" at Terminal Engineering. His World War II registration in 1942 recorded him, age 60, living in Summit, New Jersey, and employed at The Texas Co., 135 E. 42nd St., New York City. His death notice, New York Times, 22 Nov. 1972, read, "Dearborn - Richard J., of 37 Old Fort Road, Bernardsville, N.J., on November 21, 1972. Beloved husband of Frieda Dearborn and father of Richard C., Henry C., Mrs. James E. Ziegler, Mrs. Leon J. Souren, Mrs. Alexander Bedrosian and Mrs. Marjorie C. Polhemus. The funeral will be held at the Basking Ridge Presbyterian Church Friday at 2 P.M. In lieu of flowers, contributions may be sent in his name to the R. J. Dearborn Scholarship Fund, Princeton Theological Seminary." Harry F. Thompson was born in Cincinnati, 6 Oct. 1886. His association with Terminal Engineering seems to have been brief. He registered for the World War I draft in 1917 when he was the Eastern Manager at Provident Chemical Works, 90 West Broadway. He was a vice president and director at Terminal Engineering in 1918, but there is no evidence that he stayed an officer there after this date. Many patents were issued to Terminal Engineering. Most credit Willard C. Brinton as inventor. Some of these on google patents were Motor Truck for Freight Handling (1930), Freight-Weighing Device (1928), Motor-Casing Closure (1925), Object Holding Rig for Trucks (1929), Jack (1932), and Guards and Curtain Closure (1929). An elaborate lift truck manufactured by Terminal Engineering was illustrated in this article in the journal The Foundry, 1 April 1921. This article from Industrial Management, 15 Feb., 1921, describes the TEC Short Haul Truck manufactured by Terminal Engineering. Hollywood Advertising Co. were first listed in the New York telephone directory in 1932. As of 2002 they were still listed in business in Copiague, Suffolk County, Long Island. The company were also known as Hollywood Banners. As of Oct. 2012 the Hollywood Banners website proclaimed "Since 1927." Their About-Us page reads, "Founded in 1927 in Hollywood, California, we began furnishing appliqu� banners to the emerging motion picture industry. Our first silk screen printing was on theater lapel usher tags announcing a new movie named Snow White and the Seven Dwarfs. After WWII we moved east to New York with many film distribution companies, as the film canisters, marquee banners and coming attraction banners would all travel together." Hollywood Advertising was located at 600 W. 45th St. (aka 599-601 11th Ave.) from 1935 to 1947. 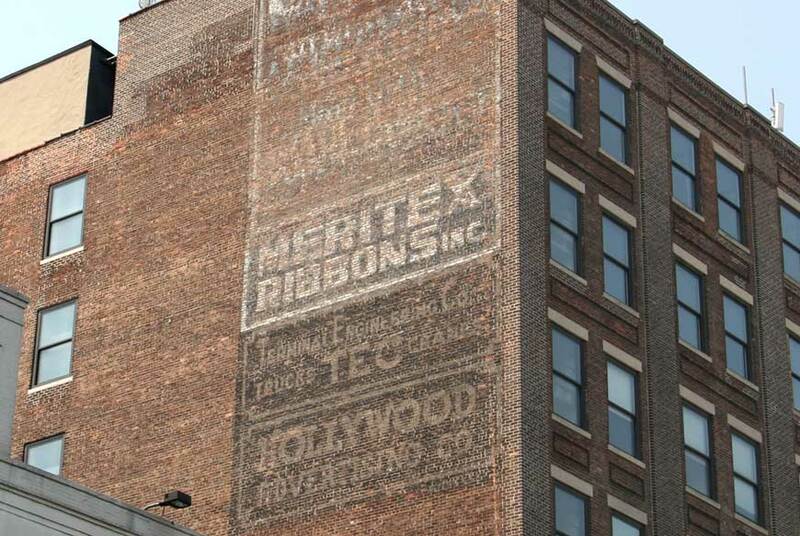 Meritex Ribbons Inc. were listed in the New York telephone directory at 599 11th Ave. from 1945-1956.